glasgow's queen street station is currently undergoing what i believe is being touted as improvements and at present, just a couple of feet past the entrance, there is nothing but wooden horadings and a few well-meaning individuals with hi-viz vests pointing out that you can't go where once you could. the trains that used to depart and arrive at queen street upper level have now been redistributed between queen street low-level station and glasgow central, a logistical nightmare that i'm very pleased is not part of my daily commute. however, on wednesday of this past week, there was need of easterly travel, thankfully not on a drastically re-routed scotrail train (how on earth did scotrail ever come to be operated by the oddly named abellio?) from my point of view, this was a journey to the far east, but then everything's relative as albert einstein used to say. you do, however, have to admire the scots' tenacity in the face of potential adversity. i have droned on ad nauseam about the weather that pervades the west coast of the country, a droning that has frequently made great use of the words rain and wind, two aspects of west coast life that are features, not bugs if you live here and probably wildly underestimated by those who don't. the east coast is not that different, but traditionally a smidgeon cooler. taking the low-level train from queen street ultimately to edinburgh waverley includes such luminary stopping points as coatdyke, airdrie, drumgelloch, caldercruix, blackridge and armadale, bathgate, all of which are preceded by the optimistically named - and once more might i remind you of the prevailing weather situation - coatbridge sunnyside. i could find no reference as to how this eponymously named railway station was blessed with such a bright moniker, but suffice it to say, on passing through said station, the weather wasn't that bad. at least, not on the outward journey. if you will forgive my incessant harping on about scotland's climate, there is a pertinence to my story. those well-versed in the art of train timetables will perhaps have realised that the final station in the above list (bathgate), is that preceding livingston north at which it is prudent to alight if you intend to visit scotland's, and one of the world's, premier cycle apparel purveyors endura. 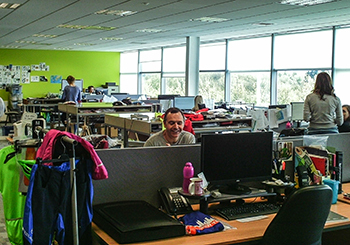 it has been of continual personal embarrassment that i have known endura managing director, jim mcfarlane, for nigh on ten years, in a blogging career that has lasted twice as long. yet this past wednesday was the first time i had made the trip eastwards to visit him and his sterling company. in the course of doing so, i may have over profusely apologised for not having ticked this particular box a great deal sooner. as i write, the movistar team have a rider in the pink jersey (amador) and valverde in fourth place. this is pertinent to my discourse, for not only do endura provide the clothing for the spanish team, but two of their top brass were meeting with jim mcfarlane on the morning of my visit, a situation that temporarily delayed a long-awaited meeting. of course, it would be a tad unseemly if visiting media persons such as myself were to be given the manager's tour. such formalities are best left to those in charge of islay's malt whisky distilleries, a fate they will be well used to by the end of next week's islay whisky festival. commerce and sponsorship are considerably more important than shooting the breeze with ponytailed members of the press, even if the latter apellation is one foisted upon me rather than cheerfully adopted. in deference to the gents from movistar and subsequently drag2zero, i was guided through the labyrinthine facility at starlaw park by pr manager katrin mcdonald and production manager alison moody. you'll have to take my word for it; it's an eye-opening experience. i fear tedium would take over were i to reiterate each stage of my tour; some things simply do not transfer well from actually being there into fascinating narrative. 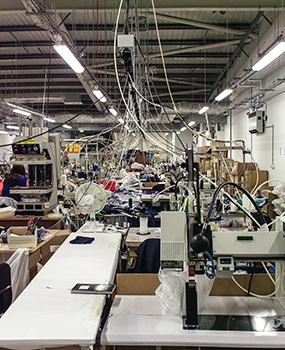 unlike many of their contemporaries and peer group, endura's facility does a darned more than simply design and market a quality range (or ranges) of cycle clothing. 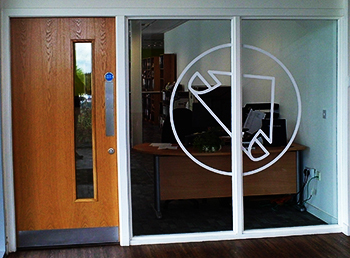 they also manufacture a substantial proportion in-house. 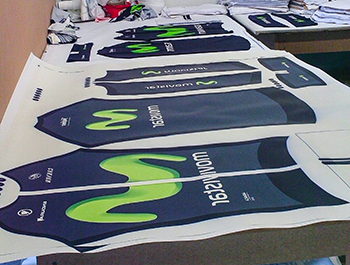 all the official movistar clothing is made in livingston, also meaning that the replica kit does too. the latter term has often been applied to a category of cycle clothing that simply embodies look-alike properties, devoid of the quality and fabric demanded by the world's top riders. in endura's case, nothing could be further from the truth. 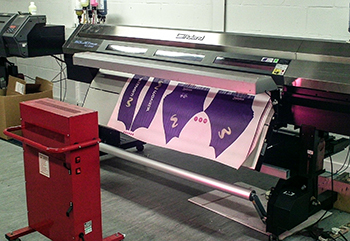 i watched a replica jersey being printed from the very same large format dye-sub roland printer from whence came the very jersey worn by amador before he nabbed pink on friday. endura also produce each and every item of their much admired equipe range at livingston as well as the rather striking official kit for this year's ride london. a facetious remark from yours truly as to whether the design department received the proverbial sketch on the back of an envelope (so to speak), brought to light that very situation. except the design i was shown was hand-drawn on a scrap of paper, rather than an envelope. endura are more than adept at producing individual designs to suit pretty much every club in the land, based on either high-quality artwork, or the aforementioned pencil sketches. you can even have riders' names applied to each of the final editions at extra cost. until recently, britain was bereft of a high-profile cycling heritage. there have been the odd (in both senses of the word) individuals who have forged across the channel and returned with the victor's spoils, but it's a heritage that pales into insignificance by comparison with that of france, belgium, italy and even holland. scotland, robert millar notwithstanding, has pretty much no road racing heritage whatsoever. 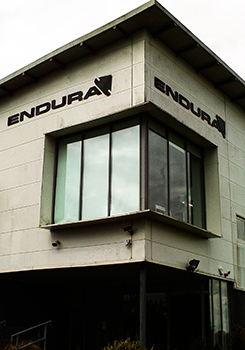 it is therefore of great national pride that endura not only exist at all, but do so at the highest level, not just in the arena of road racing, but also in the world of mountain biking, the latter a successful heritage that preceded their wholesale entry into world of skinny tyres. who better to understand the needs and requirements of the scottish-based road rider than the very chaps and chapesses who inhabit its rain-soaked, windblown landscape? passing the clothing rails that edge the design room, it's not hard to appreciate the extent and breadth of the company's endeavours on behalf of the great unwashed (you and me). if you can't find something to satisfy your idiosyncracies from amongst those garments i was briefly introduced to, then you probably need to get out more. deep in the bowels of endura ltd. and bearing more than just a passing resemblance to the shop floor of the clothing business featured in coronation street, there are two rows of sewing machines and their highly-trained operators who quite literally sew the arms onto the jerseys and the zips into the body. 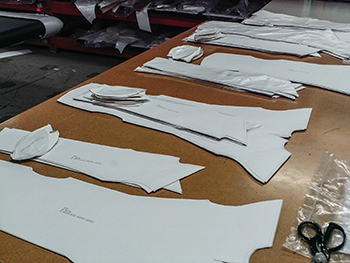 though several of the latest drag2zero influenced garments feature bonded seams, it will be a long time before any of endura's sewing machines lie silent. 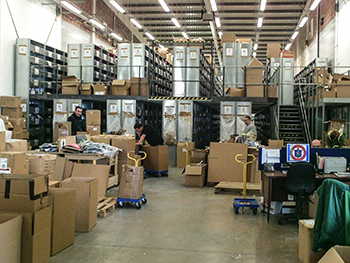 and when they say that every garment is checked prior to packaging and dispatch, they really mean every garment. i know. i saw it happen. prior to my departure once more to the twin platforms of livingston north railway station (thank you brendan) and a subsequent passing through of coatbridge sunnyside (it was raining this time), jim mcfarlane took a few minutes out from his series of meetings to make sure i left the premises. he is not at all the figure you would expect to head up an internationally renowned cycle clothing company. dressed in jeans, an endura t-shirt and an open checked shirt he's affable, relaxed, humorous and refreshingly informal. there was no sales pitch and no corporate speak, facts worthy of laudatory approbation in themselves. i'd like to thanks katrin, alison, jim and brendan for their consummate hospitality during my recent visit. it was very much appreciated.